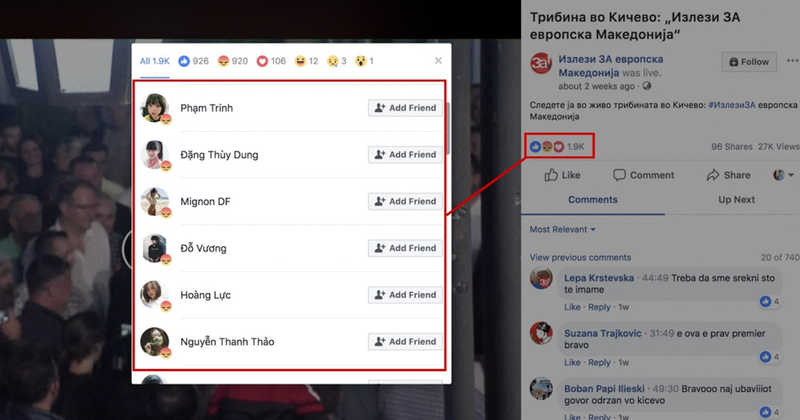 Specifically, a campaign rally featured on the “Yes” campaign Facebook page was targeted by what appeared to be a like farm — or a dislike farm in this case — made up users with Vietnamese names and profiles, which attempted to create inauthentic impression of anger among large number of viewers of a live campaign event video. The activity appeared coordinated to create a fake impression about how the public perceive and feel about the “Yes” campaign, in an attempt to sway the supporters and opponents. PM Zaev’s live streamed video for the “Yes” campaign is from an open-air town meeting in the ethnically diverse town of Kicevo. The video engagement lies at about 2,753, with over 27,000 views. But, the use of the angry emoji reaction was comparably high, spiked up to 909, and competed neck-to-neck with engagement on the happy emoji reaction icon engagement standing at 926. There was nothing exceptional, like a major rhetorical gaffe or a unique crowd reaction, during the speech compared to other events. A local NGO activist spoke first, followed by the town doctor, and PM Zaev finished the program. The last 20 minutes were left for audience questions, in which Zaev spoke about the country’s European future as the overarching theme of the campaign. The comments were also exceedingly positive with a smaller amount critical of the name change. Nothing, compared to other moments in the campaign, suggested that there would be a higher rate of angry online engagement among such a high number of individuals for this particular event. Both the “Yes” campaign for Macedonia’s naming referendum, run by the ruling social-democratic party SDSM, and the opposition VMRO-DPMNE party hold rallies throughout the country. The “Yes” campaign message, titled “Get Out to Vote for European Macedonia,” is oriented around explaining the so called Prespa Agreement between Macedonia and Greece. It solves the so-called name issue, in which Greece has blocked Macedonia’s Euro-Atlantic ambitions since the country’s independence in 1991, demanding a name change. A compromise was reached, solving the issue through the use of the name “Republic of North Macedonia”. The referendum was called for the agreement to be approved by the voters. The opposition party VMRO-DPMNE also hold rallies around the country. This is in spite of VMRO-DPMNE having no official stance regarding the referendum, and the leadership instructed the members and voters to vote their conscience. While VMRO-DPMNE has no official stance on the referendum, many of the party’s leaders maintain a clear stance against the Prespa Agreement, and VMRO-DPMNE leadership has held rallies against the referendum. In the meantime, a virtually anonymous and underground boycott campaign emerged online, mainly on social media, but also through leaflets, attempting to persuade the voters to stay home. The “Yes” coalition has focused on persuading as many people as possible to get out and vote. The campaign rallies are centered around the benefits the country would receive through future European Union and NATO membership, while the issue of the name change is clearly understated or even avoided. On Facebook — Macedonia’s main social media platform — the “Yes” campaign promotes its message by uploading videos from campaign rallies. Some of them are akin to open-air town meetings, where NGO activists or other public faces are invited to show their support and answer audience questions. Using inauthentic social media activity against political campaigns to skew the voters’ impressions and manufacture fake outrage or anger, manipulates the audiences and inserts false sentiment into the wider referendum campaign. It also discourages the voter turnout, especially in a situation where very active underground boycott campaign exists bombarding the social media users to vote. The situation is exacerbated by the fact that this was done in a multi-ethnic town inhabited by Muslim Albanians and Christian Orthodox Macedonians now living in peace, but 17 years ago there were armed hostilities in the country between Macedonian security forces and Albanian guerrillas, lasting for four months only to be stopped from escalating by the strong influence of the international community, and the fact that the both sides reached a peace agreement on August 13, 2001. Since the coordinated activity from foreign users was used in this manner only once targeting the official “Yes” campaign Facebook page, the case may have been a test of whether the tactic worked. While dislikes typically carry an ability to depress engagement, the numbers show that engagement in this case remained consistent despite the inauthentic behavior. Vladimir Petreski is Digital Forensic Research Assistant at the Atlantic Council’s Digital Forensic Research Lab. Kanishk Karan is a Digital Forensic Research Assistant at the @DFRLab.